We have dozens of Bloc Loc Rulers to make your quilting a pure delight. Each ruler solves a problem and makes your quilting faster, more precise and safer. From Acrylic Half Square Triangular Rulers to Flying Geese Rulers in every size you need – Bloc Loc ensures your quilting will be simply awesome. Create those tricky Kaleidoscope blocks with no bulk in the middle! Companion Book Kaleidoscope Heaven also available! Includes block patterns as well as five full patterns, all Bloc Loc friendly! Check out our Kaleidoscope instructional video! FREE Patterns- "A Tarted Up Pineapple", "A Tarted up Table runner", "Small block sew by number" & "A Tarted Up Pineapple Study #2"
Our Half Square Triangle rulers make the tough job of squaring up easy and fast! The groove slides along the seam to trim smaller units and allows quilters to rotate the block without lifting the ruler. The HST ruler can also be used to trim quarter square triangles and shaded nine patch units. Just think of all the projects that can be done with this ruler? Our Flying Geese Rulers lock onto both seams and allow you to trim flying geese and square in a square units fast! Construct the units using your favourite method and use Bloc Loc's Flying Geese to trim it up! Sold according to finished size with simple instructions for oversized cutting and construction included. The rulers are physically 1/2" bigger than the sizes listed. Packaged as sets with two mirror image rulers, Bloc Loc's grooved HRT rulers lock onto the seam and trim with ease. 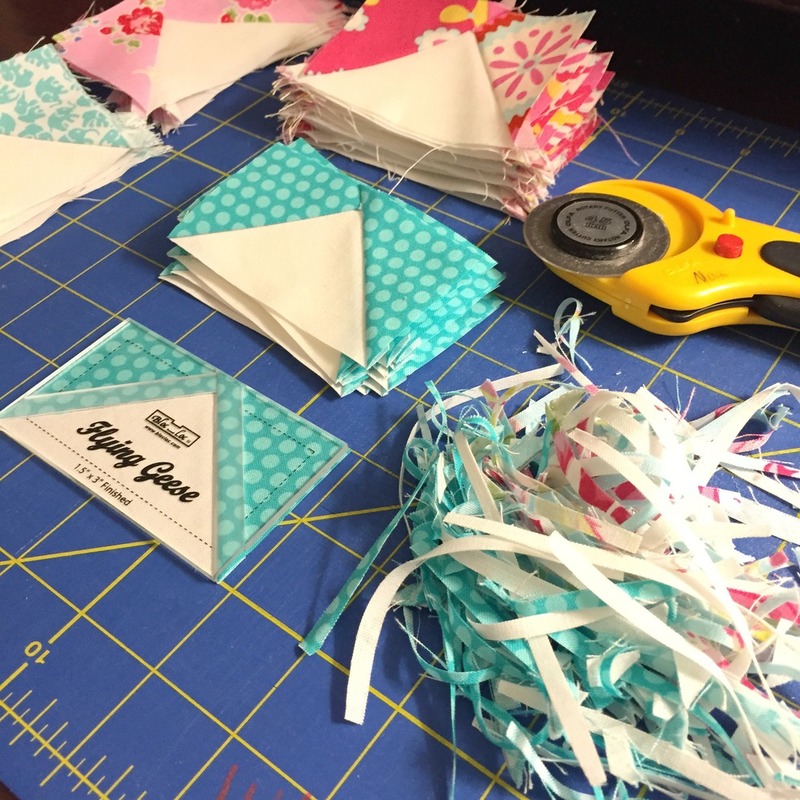 Get the look of paper piecing without the hassle! Trim your standard HRT units using the 2:1 HRT Ruler sets. These rulers are twice as long as they are wide which is the industry standard. Use it with any pattern containing half rectangle triangles to get perfect points every time. Each set of rulers are multi-size. Want to try something different? Try our stretched out versions 3:1 & 4:1 Great for borders and sashings or try it in a block design of your own. Make your quilts BLOOM with our Bloomin’ Cogwheels Rulers! 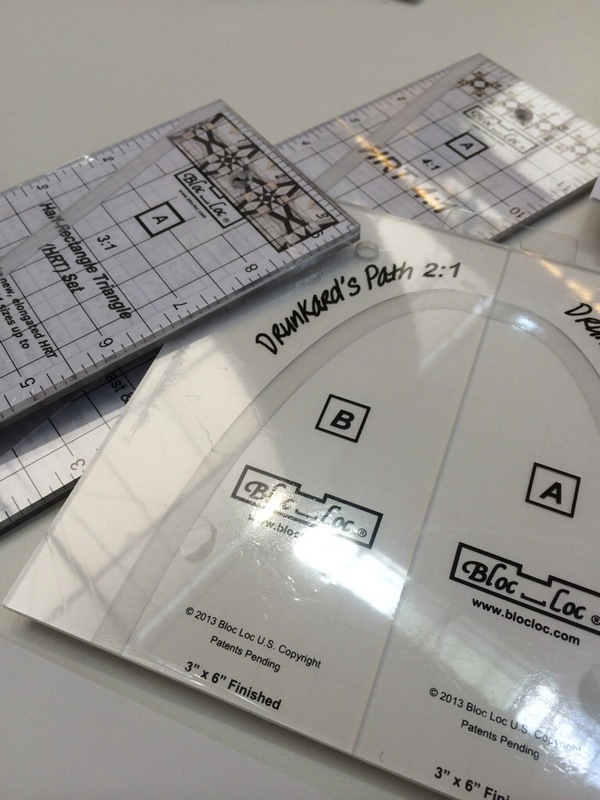 Create unique dresden plates with attitude using these grooved wedge rulers. Our 22.5 degree blade shaped, two ruler set allows you to subcut stripsets with no wasted and build units with interlocking seams. 4 Blade (22.5° wedges) – Pattern Book also available! Bloc Loc's system helps even beginning quilters construct and trim triangle in a square units quickly and accurately. The system includes two oversized cutting templates and a double grooved trimming ruler to lock onto both seams. Rulers include seam allowance and are sold by finished size. The 4" x 4" can be used to make several of the blocks in the Block Maker and Block Maker II books! All sizes can be used to make dozens of blocks and sashings. The trimming ruler is physically 1/2″ bigger than the size listed. Create super easy and super fast Kite in a Square shapes with a precision point in the corner. The Kite in a Square system includes two over sized cutting templates and a grooved trimming ruler. These rulers are sold by finished size. The trimming ruler is physically 1/2″ bigger than the size listed. The Drunkards Path system includes two over sized cutting templates and a grooved trimming ruler. These rulers are sold by finished size. The trimming ruler is physically 1/2″ bigger than the size listed. Finished Sizes Available Ration 1:1- Create King Tut's Crown, Tumbleweed or your own patterns with lighting speed using Bloc Loc's traditional drunkards path rulers! We took the traditional Drunkards Path and stretched it out! Use these fun and unique rulers to update any traditional Drunkards Path Pattern. Includes two oversized cutting templates. These elongated sizes create oval shapes. Create dynamic hexagon blocks with the Diamond in a Triangle! This ruler system lets you create the diamond in a triangle unit with ease and perfect points! Includes two over sized cutting templates and a grooved trimming ruler. These rulers are sold by finished size. The trimming ruler is physically 1/2″ bigger than the size listed. Create super accurate log cabin blocks in a variety of sizes. Bloc Loc’s accuracy and non slip technology all in one ruler! Available in many sizes, our rulers feature 1/8" increments for easy measuring. Most rulers contain 30 degree, 45 degree and 60 degree angle lines. Our rulers are completely clear! 9.5" x 9.5" * available in left and right handed versions!